Made pan mee for dinner yesterday as I have ran out of ideas on what to cook for dinner. Usually on Sundays, I have no mood to cook and I always ask hubby the same questions: What do you want to eat, what do you feel like eating, tonight eat what, etc. And his answers will always be the same: Up to you, you cook what I eat what, you decide, etc. A lot of work needed to be done to make this so-called simple meal, but it was all worth it because hubby kept praising it tasted so good and tasted like it was bought from the hawker stall. I had some chicken soup left in the fridge by the way. While that was heating up, I fried ikan bilis and shallots until fragrant. 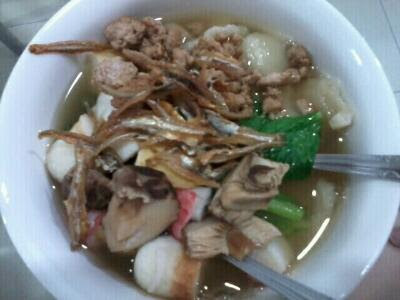 Added water into the chicken soup, and pour the sizzling ikan bilis and shallots mixture into the boiling soup. I boiled for 30 minutes, added salt to taste. 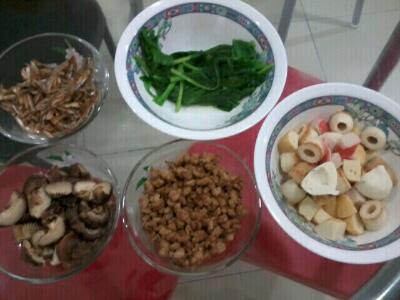 Next, I prepared the "liew" (condiments). I blanched mushroom, choy sum and assorted balls in a saucepan (separately). Then I fried ikan bilis and minced pork in another wok (separately also). 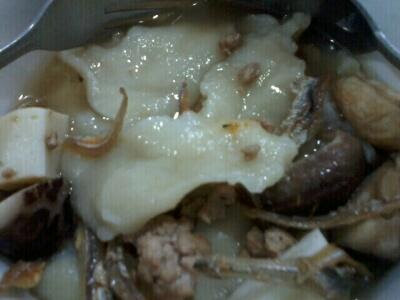 Oops, I almost forgot to write about the main ingredient - the dough of pan mee, haha. I prepared the dough about 2 hours in advance and let it sit in a bowl. I used 2.5 cups of plain flour and water, that's all. Kneaded until it reached the suitable consistency. No measurement for the water, it's all agak-agak. Pinched the dough in small pieces and dropped into the soup when it was boiling. Lots of work, but well, it was well worth it.